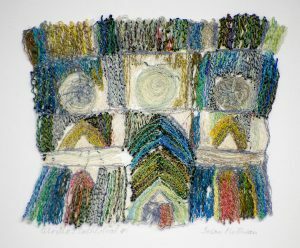 In 1988 the three leading textile art groups in Scotland shared a platform to exhibit work in a highly successful exhibition entitled ‘Three Strands’. After several other individual exhibitions, this arrangement was formalised when edge – textile artists scotland was formed in 1999 with the merger of those three textile art groups – Embryo, ‘One,6,7’ and SETA. The original groups, although coming from different parts of Scotland shared a common higher educational base in the Dundee, Glasgow and Edinburgh art schools where observed drawing was the foundation of the creative process. Now the membership is from a much broader background although everyone has followed some formal recognised education in textiles. The main aim of the group is to promote excellence in all aspects of contemporary textiles and through their exhibitions, held nation-wide, the artists of the group reach a wide audience. The strength of the work produced by the members lies in the technical expertise, diversity of subject and the approach to design.